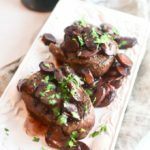 Filet Mignon with Mushroom Red Wine Sauce is a perfect date night or Valentine’s Day dinner for two! Tender juicy filet mignon is pan-seared, then finished in the oven until it is melt-in-your-mouth tender. 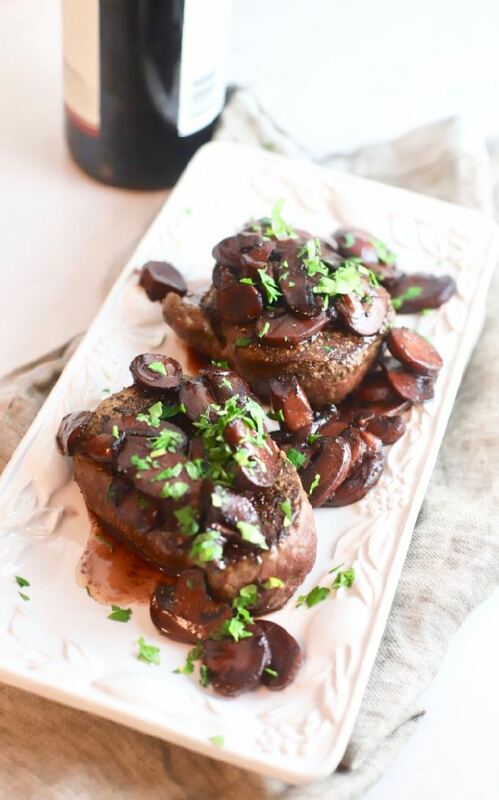 A hearty red wine sauce reduction with sliced earthy mushrooms is the perfect accompaniment. It makes this steak dinner nothing short of a food lovers dream! There aren’t too many things better in life than a good steak! 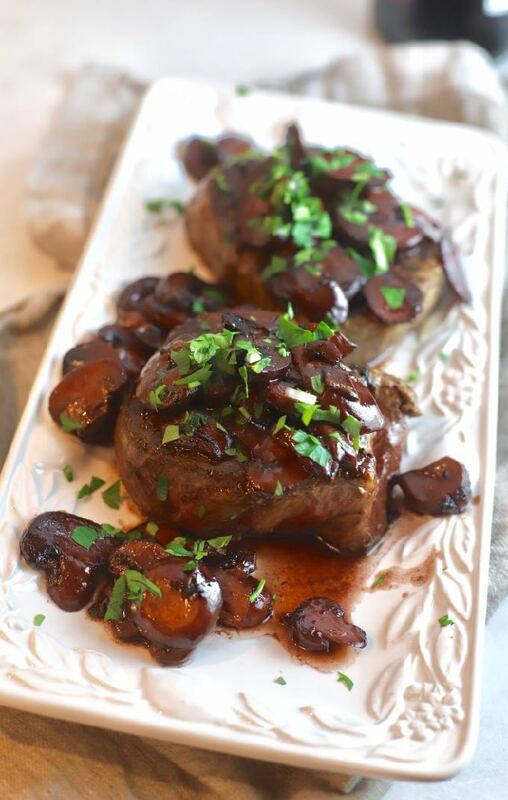 And, this decadent recipe for Filet Mignon with Mushroom Red Wine Sauce is even more delicious than it looks. First, the filet mignon is cooked to perfection using the pan sear and then finish in the oven method. Even without the Mushroom Red Wine Sauce, this steak is all a good steak is meant to be. The Mushroom Red Wine Sauce puts it over the top but would also be equally good served as a delicious side or over chicken or pork. But, the best part of this recipe is that is it so ridiculously quick and easy to prepare. With only a few ingredients and about 20 minutes, you can have this restaurant-quality main dish on the table. I served Filet Mignon with Mushroom Red Wine Sauce with Parmesan Potatoes Au Gratin and Brussels Sprout Salad with Citrus Vinaigrette. I didn’t serve dessert last night. But, you better believe on Valentine’s Day, one of the luscious desserts from my roundup post of 28 Best Valentine’s Day Desserts will be on our table. Check them out now! How to cook the perfect Filet Mignon! Generously sprinkle salt and pepper over the top, bottom and sides of the steaks. Add olive oil to a large cast iron or another ovenproof skillet over high heat and heat until it just starts to smoke. Add the steaks and sear on the first side for 2 minutes. Turn the filets over and sear on the bottom for 2 minutes. Use tongs and sear the sides of the steaks for about 1 minute on each side. Place the skillet in the oven and cook the steaks for 5-8 minutes. Thicker steaks will take more time; thinner steaks will take less time. 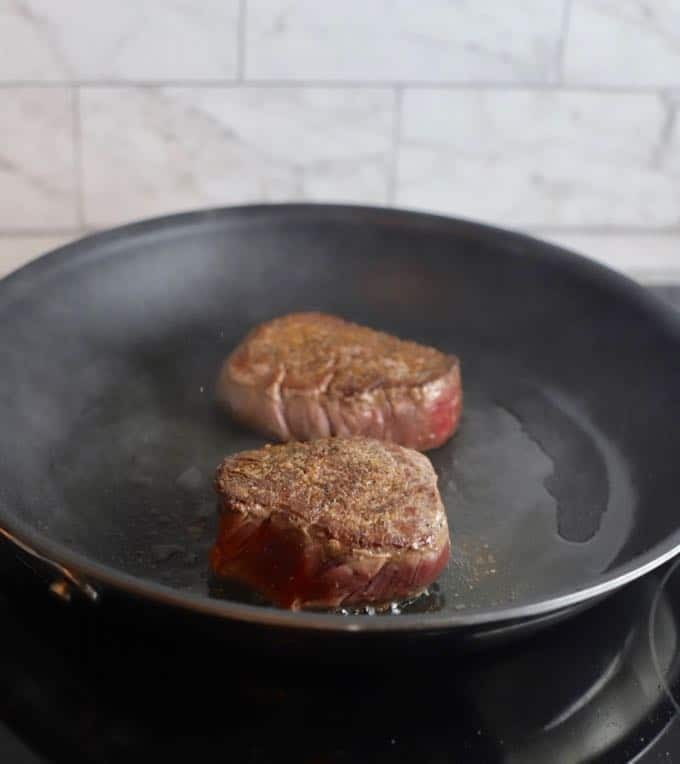 Use an instant-read meat thermometer and carefully remove the steaks from the oven when the internal temperature reaches 120 degrees F. for medium-rare or 130 degrees for medium. 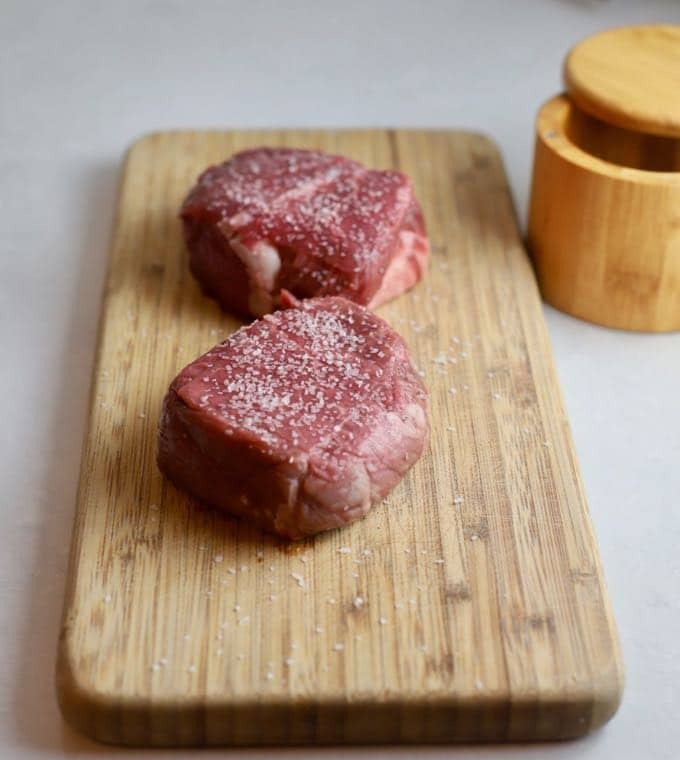 Remove the steaks from the pan and place on a plate or cutting board. Tent loosely with foil and allow the steaks to rest while you prepare the mushroom sauce. Add the red wine and cook for about 7-8 more minutes or until the wine has reduced by half. Remove the pan from the heat and add the butter. Taste, and add salt and pepper if needed. Stir until the butter has melted and spoon the mushroom red wine sauce over the top of the steaks. Garnish with thyme sprigs or parsley, if desired. 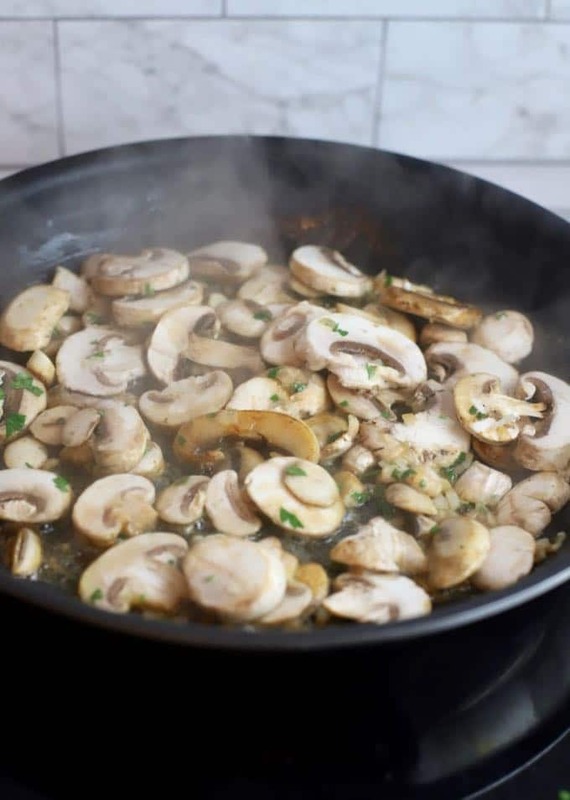 You can use common white button mushrooms, cremini or baby bellas. All of these mushrooms are mild and meaty. Of course, if you have a favorite mushroom, or want to use a blend, that’s fine too! Dry red wines have no residual sugar and are not sweet. Examples include Cabernet Sauvignons, Merlots, and Pinot Noirs. There are many others too. Never cook with a wine you wouldn’t drink. I like to use the wine I plan to serve with dinner so that the flavors will complement each other. Filet mignons are expensive. Make friends with the butcher at your grocery store and enlist their help in choosing the best steaks. USDA Prime is the best cut, with USDA Choice coming in second. If you like your steaks rare or medium rare, choose thicker steaks. If you like your steaks medium or well done, choose a thinner steak. I know I sound like a broken record but if you don’t have a good instant-read meat thermometer, get one. They are inexpensive and are a game changer when cooking meat. 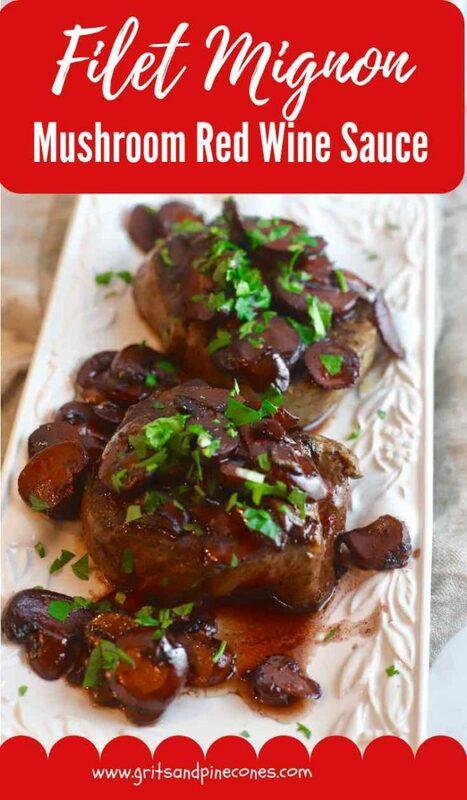 Filet Mignon with Mushroom Red Wine Sauce is a perfect date night or Valentine's Day dinner for two! Tender juicy filet mignon is pan-seared, then finished in the oven until it is melt-in-your-mouth tender. 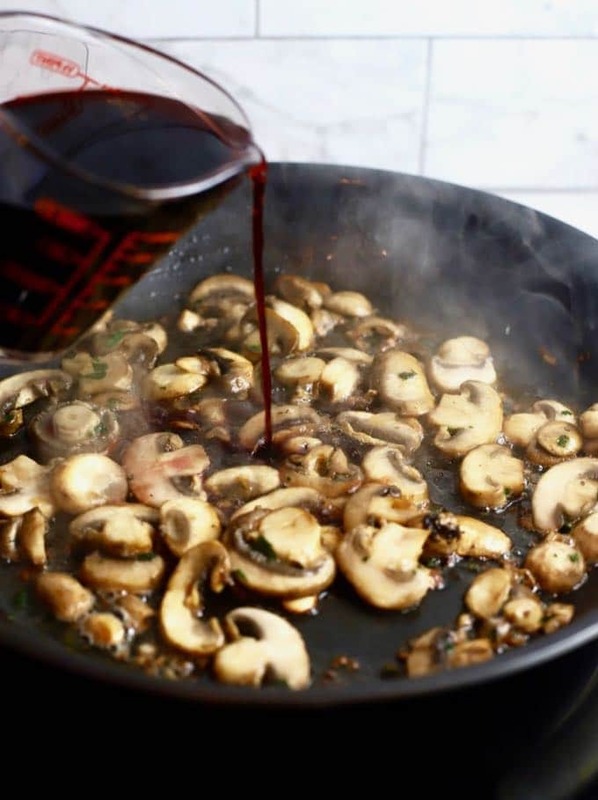 A hearty red wine sauce reduction with sliced earthy mushrooms is the perfect accompaniment. It makes this steak dinner nothing short of a dream! Add the red wine and cook for about 7-8 more minutes or until the wine has reduced by half. Remove the pan from the heat and add the butter, and salt and pepper to taste. Stir until the butter has melted and spoon over the top of the steaks. You can use common white button mushrooms, cremini or baby bellas. All of these mushrooms are mild and meaty. Of course, if you have a favorite mushroom, or want to use a blend, that's fine too! Dry red wines have no residual sugar and are not sweet. Examples include Cabernet Sauvignons, Merlots, and Pinot Noirs. There are many others too. Never cook with a wine you wouldn't drink. I like to use the wine I plan to serve with dinner so that the flavors will complement each other. I know I sound like a broken record but if you don't have a good instant-read meat thermometer, get one. They are inexpensive and are a game changer when cooking meat. Sharon, this looks fantastic. I love that it’s such an elegant dish. Perfect in time for a Valentine’s Day meal.